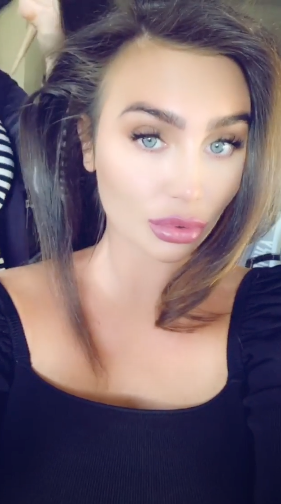 Lauren Goodger recently jetted off for an incredible trip to Dubai to catch some winter sun. And now the TOWIE star has wowed her fans by sharing an amazing new snap from her time away. Taking to her Instagram account, the 32-year-old can be seen showing off her bum in a pink bikini while standing in front of a stunning sun-set. Looking over her shoulder while her brunette hair tumbles down her back, Lauren gives the camera a serious pout as she wrote: ‘The ocean is where my heart belongs’. This comes after the reality pro gave fans a sneak peek of a recent photo shoot she’s working on, as she filmed herself wearing a khaki bikini while strolling around the secret location. Giving her best pout, Lauren looks incredible in the swimwear which shows off her amazing figure. ‘This summer going to be all mine,’ she told her 777k followers. Another snap also sees Lauren sat with her glam squad while they got to work on her hair and makeup. After her makeover, the CBB star then took a break from her hectic schedule to do some daydreaming as she shared a final smouldering pic. Meanwhile, Lauren has been undergoing a body transformation over the past few months after hitting the gym hard. But despite rumours she’s undergone surgery on her bum, the star recently told us this is definitely not true. ‘I’m so flattered that everyone thinks I’ve had bum implants but, alas, it’s all mine,’ she said.